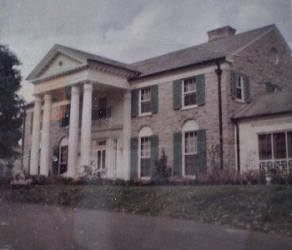 WHO OWNS GRACELAND? 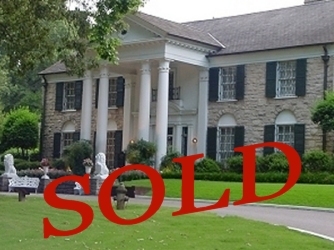 THE SALE OF GRACELAND The Memphis, Tennessee, home owned by Elvis’ former wife Priscilla Presley and their daughter Lisa Marie Presley, is the second most visited private home in the United States, after the White House, with more than 600,000 visitors a year. The 14-acre property is said to be worth around 55 million dollars. The resort-style Guest House at Graceland, will include a grand stairwell connecting two floors in the lobby that harkens back to the main staircase at Graceland itself. The hotel, scheduled to open in fall 2015, also will include Jungle Room-inspired prints and accents, plus a sports bar and lounge that recalls the design of Gracelands billiard room. Other design touches include the separation of the hotel façade into three components to give it the feel of three separate residential-scale hotel buildings added over time. The purchase gives Authentic Brands, control of Elvis Presley Enterprises, which manages the licensing and merchandising rights to Presleys image, name and likeness, in addition to a massive collection of music, photos, movies, television appearances and performance specials featuring the Elvis Presley. Weinshanker, Authentic Brands and the Presley family will partner in operating Graceland. A purchase price wasn’t disclosed. ABG is an intellectual property corporation in New York that manages brands, including those of Marilyn Monroe and Muhammad Ali. This is an exciting day for Elvis and his fans, says, Priscilla Presley. We look forward to working with the ABG team to further promote the legacy of Elvis. This is the opportunity the family has been envisioning to expand the Graceland experience and enhance Elvis image all over the world. In 2012, Elvis Presley Enterprises CEO Jack Soden said the licensing business generated about $32 million a year in revenue. Even in death, there can only be one King. Reclaiming his top spot on the list is Elvis Presley, whose Estate generated $49 million in the past year. CKX Entertainment, the publicly traded firm which presides over the bulk of the Elvis empire (daughter Lisa Marie Presley retains a 15 percent stake) announced a massive overhaul of Graceland this summer. Among the changes are a new hotel convention center, a state-of-the-art multimedia museum and visitor’s center. The plans are paying off: Revenues from Graceland were up 15 percent this year, to $35 million. And that doesn’t include royalties generated from Elvis music, DVDs and licensing deals like the one struck with Cirque du Soleil for an Elvis-themed revue in Las Vegas.